– How do people understand robot behaviors? – What do we know about people and robots collaborating? – Can a robot understand human social behaviors? – How does knowledge about human social relationships necessitate a change in our thinking about how humans should be modeled? – How can the design of robots and their behavior improve acceptance of robots in everyday environments such as our homes, airports, museums, schools, roads, and hospitals? Vanessa Evers is a full Professor of Human Media Interaction at the University of Twente. 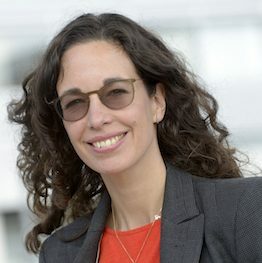 Her research focuses on Human Interaction with Autonomous Agents such as robots or machine learning systems and cultural aspects of Human Computer Interaction. She specifically likes to take theories on human behavior from social psychology and see if similar processes occur when we interact with technology. She is best known for her work on social robotics such as the FROG robot (fun robotic outdoor guide), that can interpret human behavior automatically and respond to people in a socially acceptable way.